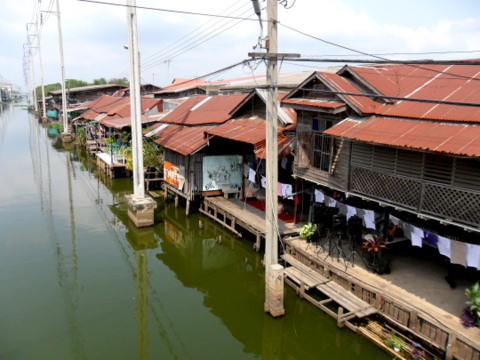 The Hua Takhae market is in an old community along the Prawet Burirom canal in eastern Bangkok. 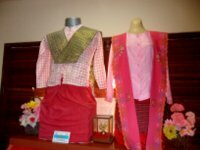 It has recently been revived with an arts and craft market on the first weekend of every month. 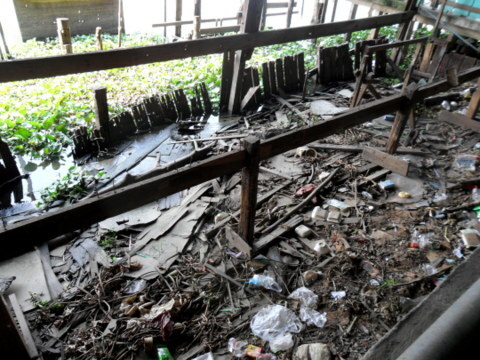 To get there, I passed through a transition from a busy urban scene to the quiet life along a canal in old Bangkok. 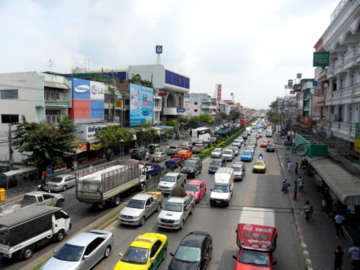 Lat Krabang Road is like any busy main street in Bangkok. 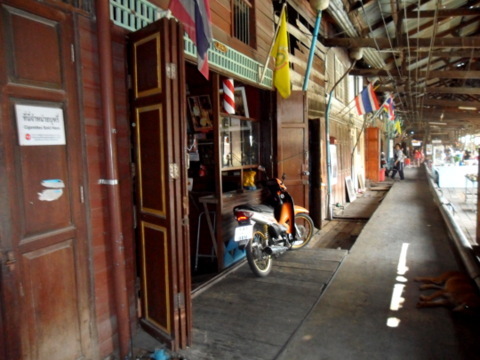 As I turned off into Soi 17, I entered a narrow and relatively quiet lane lined with market stalls on both sides. 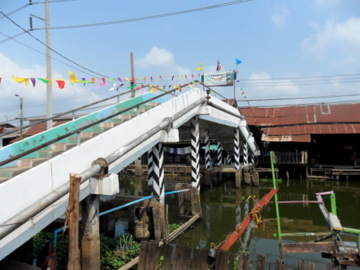 At the end of the soi, there’s a bridge that spans a canal. Cross over and enter a place where time has almost stood still. 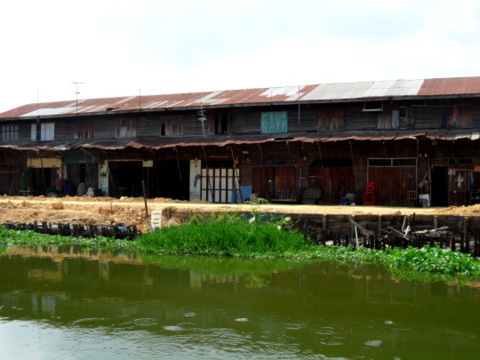 The community consists of old two-story wooden houses that has a century-old market with shops selling provisions, dresses, cakes, various types of food, a TV repair shop and a beauty salon. 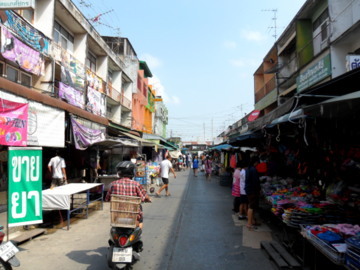 Plans to develop the new Hua Takhae market across the Lat Krabang Road almost spelt the demise of this old market. Over time, many residents have moved out as there were several homes that were locked up. The place gradually became run-down. 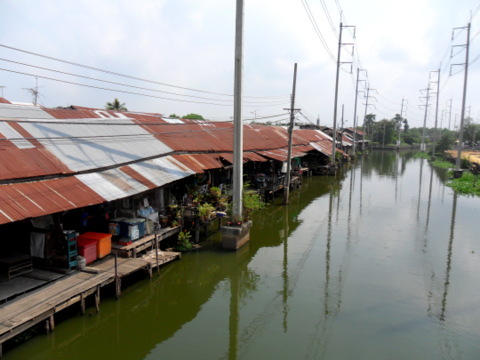 However, some of the residents thought of a novel way of reviving life in this old community market. In conjunction with the art fraternity from the Bangkok College of Fine Arts and the King Mongkut Institute of Technology, they started an art market on the first weekend every month. 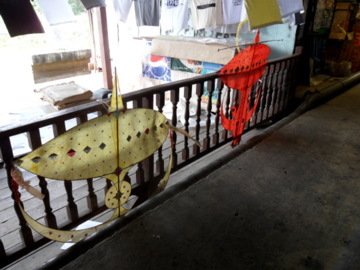 Art and craft are on display for sale, art workshops are conducted, and art students come here to paint in this peaceful atmosphere, all of which has brought back life to this old market and community. I can imagine what life was like here 50 years ago when the community was much bigger, canal boats were the main mode of transport, daily life and commerce were conducted along these waterways. That was the time when boats were the main mode of transport. 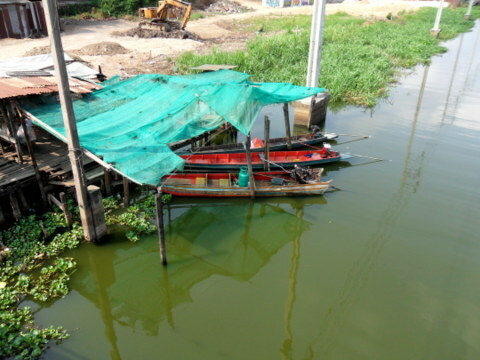 Boats are still being used here. On the day of my visit, there was a traditional Thai dance troupe made up of students from a school nearby. They put up a brilliant performance. There’s a donations box for the cost of their costumes, do give them your support. If you can’t see the video, click on this link. 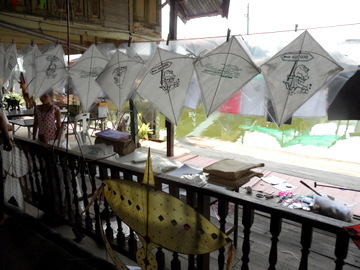 There is a kite-maker selling kites and T-shirts. I am told he gives free kite making lessons to preserve the art of kite making. 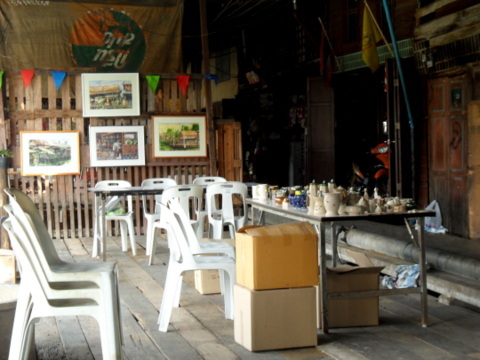 The third stall is an art gallery of paintings and sold ceramics. I was expecting more. When I had a bowl of noodles from a friendly lady vendor, I found out why. The art organizers had commitments somewhere else that morning otherwise there would be more activities. Then she told me more about the Hua Takhae community. 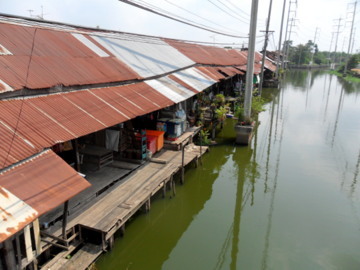 Shopkeepers live here all their lives and some have their food stalls just by the banks of the canal outside their homes. The shops here are open every day. It’s just the art market that’s held on the first weekend of every month. 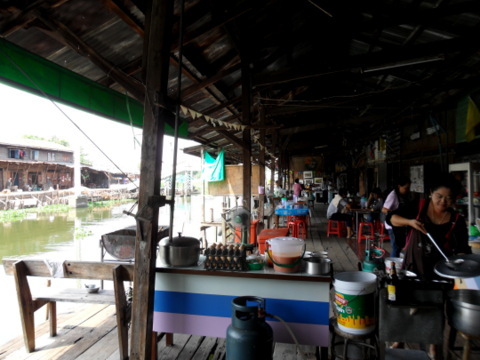 There were a number of other food vendors along this boardwalk by the canal. According to her the development across the canal is for a boardwalk along the banks, space for more stalls perhaps? I’ll need to pay another visit to this art market in the following month to see the art and craft market in full swing. The atmosphere is peaceful and breezy notwithstanding the hot weather in March and a very pleasant way to spend a Saturday morning. 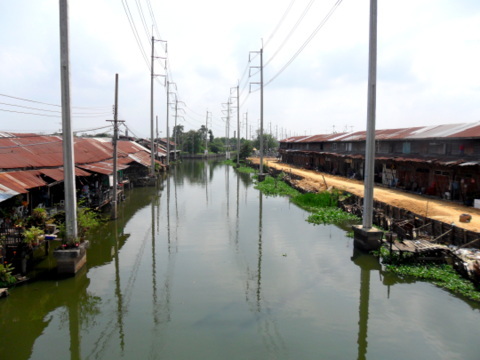 Nonetheless it was still an enjoyable trip to see an old community and their way of life, their efforts in reviving their market in one of the last frontiers of old Bangkok. I sincerely hope that the community here can successfully revive the Hua Takhae market and restore it to its former charm. Take the Suvarnabhumi Airport Link to the Lat Krabang station which is just one station before the airport. There are plenty of taxis at the Lat Krabang station. There are also a "song taeow" service (pick-ups running on fixed routes and at a fixed prices) plying between the Lat Krabang station and Hua Takhae market. These pick-ups are white but wordings are in Thai. I noticed only one vehicle with the words "Airport Link" printed in English. It’s more comfortable and faster to take a taxi to the Hua Takhae market. The fare is around 55 baht depending on traffic conditions. 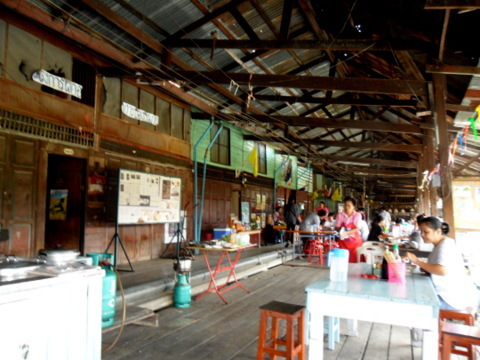 The old Hua Takhae market is open every day. The art market is only open on the first weekend of the month.